Spacious 4/5 bed period property in approx. 2 acres of stunning gardens. Located along a quiet lane in open country close to the charming village of Burton In Lonsdale, Greta Bank dates back to around 1840 and has been sensitively updated by the current owners to combine comfortable modern living with period elegance. Ideal for families and entertaining, properties of this type and location are rare to market and early viewing is therefore highly recommended. Understood to have once been the home of the local pottery owner, Greta Bank retains many charming period features including, decorative architraves, panel doors, oak bannisters and fireplaces. On the ground floor the accommodation comprises, entrance hall with striking feature staircase, living room with bay providing garden views, dining room with multi-fuel stove and bay with garden views, modern fitted kitchen, cloakroom, large utility room and access down to the large 3 room cellar. On the first floor there are 2 large double bedrooms, one with en-suite, along with a good-sized family bathroom. 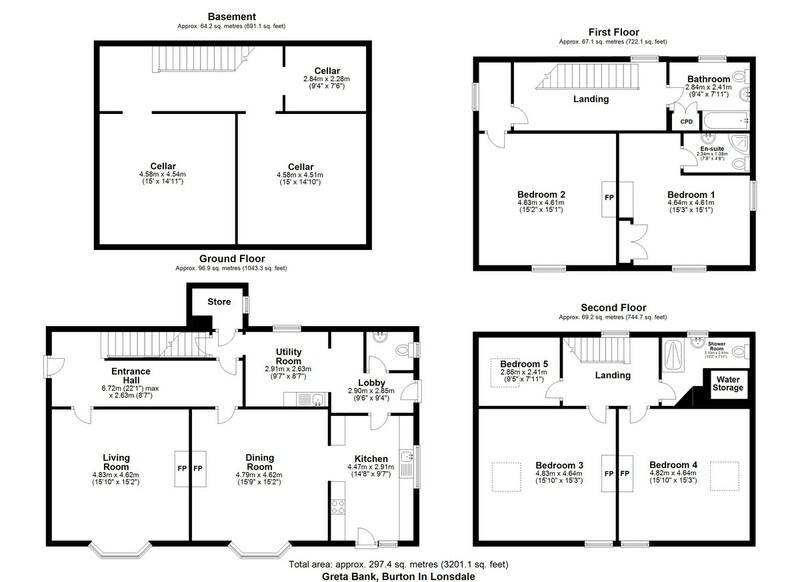 On the second floor there are 2 further large double bedrooms, shower room and an additional bedroom/storeroom. Outside and across the lane, there is a double garage with adjacent garden area. A gated driveway leads to the property with plenty of off-road parking available. The stunning gardens combine lawns, mature borders, shrubs and trees with a conservation area, large patio for entertaining and newly built external store. A haven for wildlife, the peaceful grounds extend to approx. 2 acres. Greta Bank is on mains electricity with oil-fired central heating. Drainage is via a shared septic tank in an adjacent field. The property takes its water from a natural well with a newly installed EU compliant filtration system installed in 2018. The house has UPVC double glazing, with the exception of the cellar and store windows. Greta Bank is connected to B4RN high speed internet. Barnoldswick Lane is a charming country lane just outside the village of Burton in Lonsdale. The property enjoys views across the fields to the village, with its locally well-known church spire. The village itself has a popular grocery store and pub. The market town of Kirkby Lonsdale is a ten minute drive away, providing great places to shop and eat. Trains on the Lancaster/Leeds line can be caught at Bentham. Skipton and Kendal are assessable via the A65 and Lancaster and the M6 can be reached within 30 minutes. The stunning Yorkshire Dales are close at hand and Ingleborough is a dominant feature to the local landscape. The Forest of Bowland Area of Outstanding Natural Beauty is nearby and the Lakes can be reached in less than an hour. Bentham has a GP Surgery, modern primary school and a good range of shops and pubs. Burton in Lonsdale is in the catchment area for highly regarded secondary education at QES, Kirkby Lonsdale. The attached property has access through the gate from the lane to a parking area next to their property and pedestrian access to their back door. The bore hole for their property is located in the driveway and Greta Bank has connection rights to this, if required. BASEMENT Accessed via the utility room, stone steps lead down to a useful storage area with flagged floor. The natural well is located here. Open doorways provide access to the 3 cellar rooms. CELLAR ROOM 15' 0" x 14' 10" (4.58m x 4.54m) A large cellar room with natural light from a window beneath the bay. Light and power. CELLAR ROOM 15' 0" x 14' 9" (4.58m x 4.51m) Another large cellar room with natural light from a window beneath the bay. Coal Shute. Water filtration system. Light and power. CELLAR ROOM 9' 3" x 7' 5" (2.84m x 2.28m) Smaller cellar room with light. ENTRANCE HALL 22' 0" x 8' 7" (6.72m x 2.63m) Grand entrance hall with UPVC double glazed front door. Carpet. Radiator. Stairs to first floor. Doors to living room, dining room and utility room. LIVING ROOM 15' 10" x 15' 1" (4.83m x 4.62m) Elegant living room with UPVC double glazed window providing views of the gardens. Attractive period fireplace with feature arches to each side. Stunning William Morris wallpaper. Carpet. Radiator. DINING ROOM 15' 8" x 15' 1" (4.79m x 4.62m) Good-sized dining room with UPVC double glazed window providing views of the gardens. Feature stone fireplace with multi-fuel stove. Feature period arches. Built-in cupboards. Carpet. Radiator. Open doorway to kitchen. KITCHEN 14' 7" x 9' 6" (4.47m x 2.91m) Built by the current owners, the modern fitted kitchen has a UPVC double glazed door and window to the garden aspect and UPVC double glazed window to the side aspect. Range of wall and base mounted fitted units. Sink with drainer. Integral appliances include, oven, hob with extractor over, fridge freezer and dishwasher. Laminate flooring. Radiator. Door to utility room. LOBBY 9' 6" x 9' 4" (2.90m x 2.85m) Max. UPVC double glazed side access door. Tiled floor. Door to cloakroom. Opening to utility room. CLOAKROOM Ground floor cloakroom with UPVC double glazed window to the side aspect. WC. Wash hand basin. Tiled floor. Radiator. UTILITY ROOM 9' 6" x 8' 7" (2.91m x 2.63m) Good-sized utility space with UPVC double glazed window to the rear aspect. Sink with drainer. Plumbing for washing machine. Lobby providing access to the basement and a store room with window to the side aspect. Tiled floor. Radiator. LANDING Spacious landing with UPVC double glazed window to the rear aspect. Carpet. Radiator. Stairs to second floor. Access to 2 bedrooms and the family bathroom. BEDROOM ONE 15' 9" x 15' 2" (4.82m x 4.64m) Double bedroom with UPVC double glazed windows to the garden and side aspects. Built-in cupboard. William Morris wallpaper. Carpet. 2 radiators. Door to en-suite. EN-SUITE 7' 8" x 4' 6" (2.34m x 1.38m) En-suite shower room with shower, WC and wash hand basin. Extractor fan. Laminate flooring. Heated towel rail. BATHROOM 9' 3" x 7' 10" (2.84m x 2.41m) Good-sized family bathroom with UPVC double glazed window to the rear aspect. WC, wash hand basin and bath with shower over. Large built-in cupboard housing the hot water cylinder. Laminate flooring. Heated towel rail. BEDROOM TWO 15' 2" x 15' 1" (4.63m x 4.61m) Bedroom 2 has a vestibule area with UPVC double glazed window to the side aspect. Carpet. Radiator. Door to bedroom. UPVC double glazed window to the garden aspect. Stunning period feature fireplace. William Morris wallpaper. Carpet. Radiator. LANDING UPVC double glazed window to the rear aspect. Access to the 3 bedrooms and shower room. Ideal guest accommodation. BEDROOM THREE 15' 10" x 15' 2" (4.83m x 4.64m) Spacious double bedroom with UPVC double glazed window to the garden aspect and Velux window to the roof. Stunning period fireplace. Laminate flooring. Radiator. BEDROOM FOUR 15' 9" x 15' 1" (4.82m x 4.62m) Another spacious double bedroom with UPVC double glazed window to the garden aspect and Velux window to the roof. Stunning feature fireplace. Laminate flooring. Radiator. SHOWER ROOM 10' 2" x 7' 10" (3.10m x 2.41m) Modern shower room with UPVC double glazed window to the rear aspect. WC and wash hand basin. Cupboards housing water storage tanks. Laminate flooring. Heated towel rail. BEDROOM FIVE 9' 4" x 7' 10" (2.86m x 2.41m) Bedroom or storeroom with Velux window to the roof. Laminate flooring. Radiator. FRONT Large double garage and adjacent garden area with mature trees. Located across the lane. REAR Gated driveway. Plenty of off-road parking. Large gardens comprising lawns, mature shrubs, borders, trees and conservation area. Large patio seating area. Newly rebuilt external store. A real haven for wildlife with pleasant country views.